IOSi's local market strength includes Outsourced IT Support, Managed Security, and Application Hosting Services. We are a Microsoft Certified Partner and the only WatchGuard Certified Training Partner in Canada at the Expert level. We know networks. Networks That Work. Without the Big Business Cost! 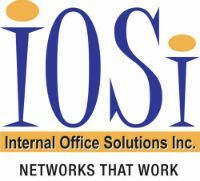 IOSi — Internal Office Solutions is a technology integration firm specializing in reliable networks. Our primary goal is to provide our clients with Name Brand mainstream supported solutions, customized to fit their specific requirements. Internal Office Solutions' staff are certified professionals. Security is a growing concern for most companies. Learn about the latest IOSi events and news. Learn why our clients maintain their loyalty to IOSi for their IT Outsourcing & Support needs. Submit and manage help desk service tickets using our intuitive client portal. A handy tool which allows dekstop sharing when working with our technical staff.